Essere nostro ospite presso la nostra 'casa lontano da casa'. Caricato con gli aggiornamenti del nostro 4 camere da letto, due bagni, a casa con privato proiettato in piscina offre ripiani in granito in cucina e bagni, piastrelle di travertino nei bagni, e mobili nuovi in ​​soggiorno. TV via cavo e lettori DVD in tutte le camere da letto .. La master suite ha un letto king, seconda camera ha una regina, e il terzo e quarto camere hanno due letti singoli ciascuna, e il soggiorno ha un divano letto. Per il divertimento in famiglia in più, godere della nostra sala giochi, attrezzata con un tavolo pieno da biliardo, biliardino e air hockey. Abbiamo anche il servizio internet wireless. Godetevi la vista tranquilla e privata della zona di conservazione nel nostro cortile, e se ti piace il sole, godersi il sole, mentre seduto in piscina (sud) per tutto il pomeriggio. Cucina Servizio completo e grill a gas per grigliate all'aperto. Bagno padronale ha granito contatore, doppi lavandini, vasca da giardino separata e doccia con piastrelle di travertino. Secondo bagno completo ha anche contatori di granito doppi lavandini e doccia in travertino. This vacation home was exactly as described and as seen in photos! It was very clean, very comfortable and had everything we needed and more! The air conditioner worked well and the ceiling fans were great to have, as it was a very hot week. Communication was always prompt. We had no concerns during the week so we never contacted the management company. The pool was amazing. It was clean, a good temperature, a good size, and my kids loved it (we went in the pool everyday often twice). The neighbourhood was quiet and safe. The kitchen was great and had lots of dishes and utensils. Washer and dryer worked well, lovely to have laundry soap and dish soap available, a very nice convenience. Easy to get to Disney parks and universal (although a little further away). Close to grocery store and Walmart. Thank you very much for the amazing vacation! We had a wonderful time! First impression is most important impression. This was my first time traveling and not actually staying in a hotel. My family ans I were extremely pleased with the overall experience. Beautiful home. We enjoy staying in this neighborhood every year, and this home was very relaxing and peaceful. We look forward to coming back. 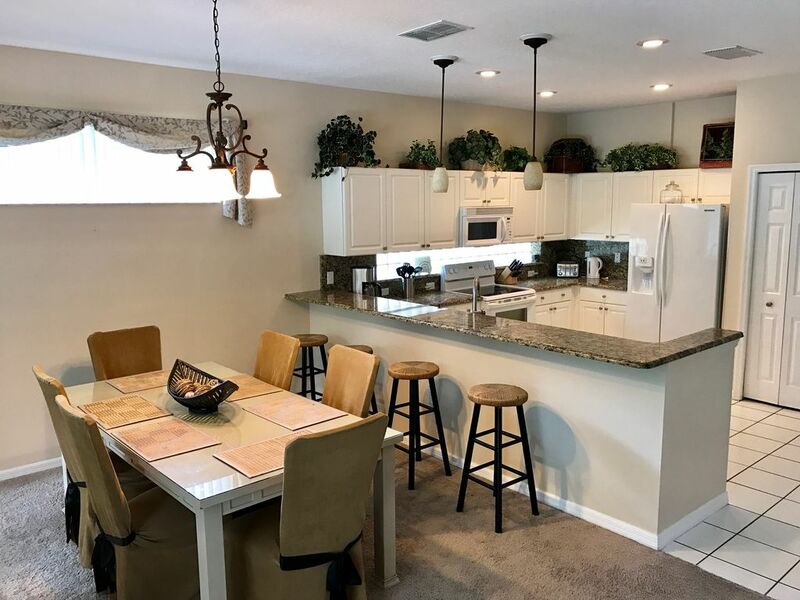 We really enjoyed our stay the homes location is absolutely perfect for the activities we wanted to do.We had a Plumbing issue and was corrected quickly. The pool BBQ and patio furniture were totally wonderful. We will most certainly be using Homeaway and thank you for all you do. Thank you - we love the location as well. Glad you enjoyed your stay at our home! This home was perfect for our vacation! Great place to relax or run around town! It was our first time to Orlando and your home was setup great for the kids to swim all day. We enjoyed pool heat. Bugs in garage but it's Florida-it will be everywhere! Thank you for the comfy beds and TV's in all rooms. We will be back! Happy to hear you enjoyed your stay, and the kids loved it! If the kids are happy, everyone's happy :). Be sure to check back in with us for your next visit.